If you've ever suffered from an anxiety attack, you know how traumatic they can be. Episodes are most often caused by a high amount of stress in the body, wherein blood flow is sent rushing straight to the brain. Anxiety attacks take a toll on both mental and physical health. Chronic anxiety causes a number of disorders and women make up two-thirds of the estimated 57 million adults who suffer. 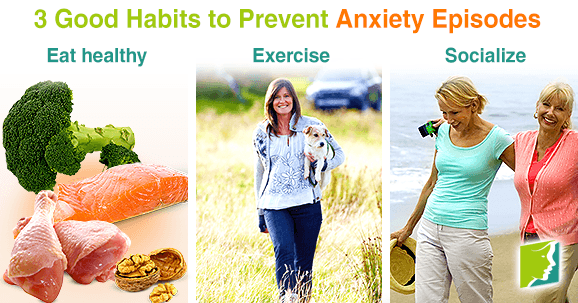 Read on to learn about the three great habits that help prevent anxiety episodes. It is highly important to maintain level blood sugar. When you skip meals or eat too large of portions, you can cause sugar levels in the body to fluctuate drastically, leading to a rush of adrenaline. The unexpected fluctuation may trigger panic attacks for some people. Incorporate leafy green vegetables and whole grains into your diet for the best results. Grains like brown rice or wheat bran help the body make serotonin, which leads to elevated moods. It is also important to intake B vitamins to help reduce stress. Magnesium-rich foods - such as salmon, chicken, nuts, and broccoli - can be a great addition to your grocery list. In addition, avoid beverages that contain caffeine or alcohol. They have been shown to worsen anxiety for most people. You may also want to avoid foods with a high sugar content. High sugar intake can cause your blood glucose levels to fluctuate, increasing your risk of having an anxiety attack. Exercising is vital to mental health. Studies show that a simple 30-minute walk can elevate depressed moods and reduce stress. It is known that those who get regular exercise are also 25% less likely to develop an anxiety disorder. Whether you run a mile or practice something relaxing like yoga, regular exercise will most definitely have a positive effect on your brain and your body. Spending time with loved ones, friends or family, can take your mind off the worries of the world and put your stress levels to rest. Having a support system of people who care can provide comfort and reduce anxiety from your life. Anything from a nice meal to a phone call with an old friend is recommended. It's important to put yourself out there and maintain a healthy social life. Your sense of self-worth will increase tremendously, reinforcing positive thoughts and a feeling of security. There are times in life when stress and anxiety are inevitable. If you are anxiety-prone, it is important to adopt the three great habits listed above to improve your quality of life. You don't have to be a victim to anxiety. Get out there and take on the world!